Occupational projections, also known as forecasts, provide detailed information on the estimated activity for each occupation in areas of employment, growth rate, total annual openings, wages, career preparation and skill requirements. Data is available for the State of Iowa and by Iowa Workforce Development (IWD) region. Data can be viewed and explored in the Tableau visualization below. Navigate the various tables and charts by using the five tabs at the top of the frame. Data can be customized by selecting a time-span, followed by level of detail, geography and occupational title. As selections are made the table and chart will update accordingly. The tables can be sorted by hovering over the column headings and clicking the icon that appears. To view occupations by education level use the filter to the right of the chart. The data is also available in a CSV file and a series of Excel files. Click the buttons below to download the files. Summary reports, by IWD region, are provided in a drop-down menu at the bottom of the page (note: all of these reports are PDF files). 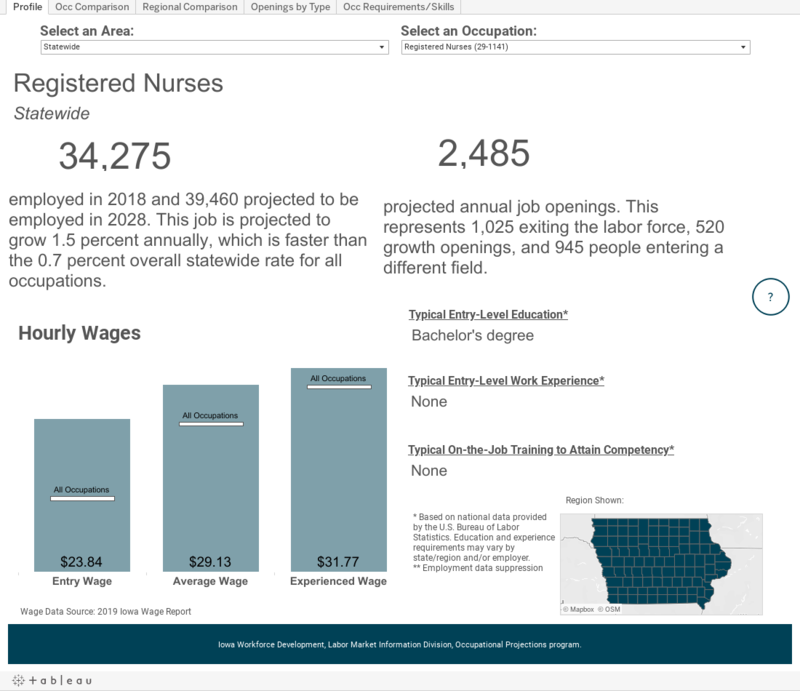 To learn about the new separations and openings methodology in occupational projections, see the Bureau of Labor Statistics' explanation or read the article on page 27 of the 2018 Iowa's Workforce and the Economy. Occupational information may be missing in cases where limited information for an occupation is available.